Beef, orange juice, ginger, Bhut Jolokia Ghost Pepper, black pepper, soy sauce (gluten free), worcestershire sauce (gluten free), liquid smoke, garlic powder, onion powder, crush red pepper, other spices. The first flavors that hit my palate is a faint ginger that immediately gives way to the natural taste of ghost pepper chile. There's a tanginess that follows, along with a fruity character. The chewing brings on a light salt, along with touches of garlic and onion. The soy sauce becomes lightly noticeable in the latter part of chewing, while the natural meat flavors come in. For being marketed as a Ghost Pepper beef jerky, with "orange" and "ginger", it holds up. The Ghost Pepper is very noticeable in terms of flavor, and also generates a good deal of heat. Each individual piece doesn't quite deliver the same tongue-piercing heat as you'd expect from a Bhut Jolokia, but the heat does ramp up as you eat through the contents of the package. The orange is noticeable mostly as a fruity character and tanginess. The ginger, however, is less noticeable, only detected in the first few seconds. The heat rates a "Medium Hot" (level 4 out of 5) on my personal heat scale. Otherwise, the primary taste profile is a light garlic and onion flavor, with a light salt, delivering a good deal of Ghost Pepper flavor. The fruity, tanginess is there in the background, while hints of soy sauce and natural meat flavors linger. 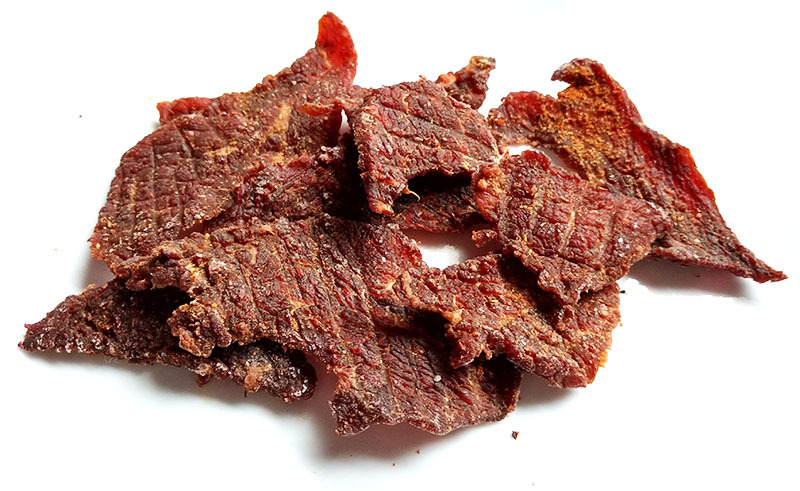 This Orange Ginger Ghost Pepper Beef Jerky from 4 Seasons delivers a nice dose of Ghost Pepper, mostly through its flavor, but still manages to offer up enough heat to bring on a light sweat on the scalp. I really like the fruity tanginess in this supportive role; it almost tastes like its a part of the Ghost Pepper instead of trying to compete. 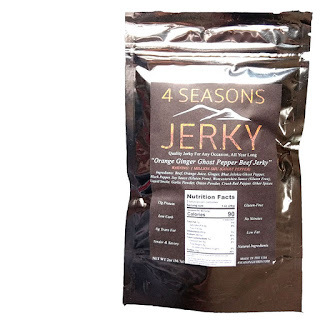 In fact, 4 Seasons Jerky does a great job of making the Ghost Pepper the star ingredient. Even though it's not quite as hot as a Ghost Pepper itself, the heat is still strong enough to satisfy culinary masochists, while allowing you keep reaching for more pieces. Ginger lovers might be disappointed to discover their favorite spice doesn't show up well in this. 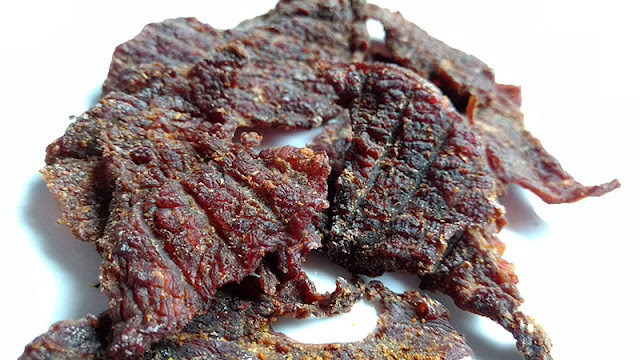 But overall, as a Ghost Pepper jerky, this one is a "must try". Great work on the review and nice photos! Keep up the good work you guys! Thanks a million!